Sundary the 10th of May the dinner reception will be held at the Stockholm City Hall. 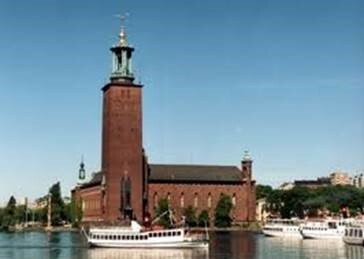 Stockholm City Hall is the building of the Municipal Council for the City of Stockholm in Sweden. It stands on the eastern tip of Kungsholmen island, next to Riddarfjärden‘s northern shore and facing the islands of Riddarholmen and Södermalm.